Foxtel execs, presenters and media gathered at FOX Studios last night for the launch of the Pay TV provider’s 2013 Programming highlights. Foxtel ambassador Chris Hemsworth opened proceedings before appearances by CEO Richard Freudenstein then Jennifer Hawkins, Matt Moran, Deborah Hutton, Paul Roos & Matt Shirvington, and cast members of Wentworth: Nicole Da Silva, Leeanna Walsman, Celia Ireland, Aaron Jeffery and Robbie Magasiva. In attendance were Sam Worthington, Peter Maddison, Andrew Winter, Shayna Blaze, Alex Perry, Charlotte Dawson, Lucas Callaghan, Adam McDonald, Didier Cohen, Sam Moran, Brendan Moar, Marty Smiley, with Danny Clayton as after-party DJ.  Foxtel will continue to make the world a smaller place with its express from the US strategy in 2013. An unprecedented number of programs will screen just hours after their US broadcast; including Girls, Game of Thrones, True Blood, Dexter, Boardwalk Empire, Sons of Anarchy, Enlightened, Veep, Eastbound and Down, Treme, The Newsroom and Mad Men all on showcase; The Carrie Diaries, Revolution, Chicago Fire, Falling Skies, Grimm, Vampire Diaries on FOX8; The Walking Dead, Da Vinci’s Demons, Transporter: The Series on FX; Smash and The Glades on SoHo; The Real Housewives on Arena; and The Colbert Report, The Daily Show and TOSH.0 on The Comedy Channel.  Australian drama Wentworth will launch on Foxtel’s SoHo channel in April. The 10 part series, produced by FremantleMedia Australia, is a modern day reimagining of the iconic drama Prisoner. The ensemble cast features Danielle Cormack, Catherine McClements, Nicole Da Silva, Kris McQuade, Leeanna Walsman, Kate Atkinson, Celia Ireland, Shareena Clanton, Aaron Jeffery and Robbie Magasiva.  Foxtel, in association with Matchbox Pictures, will produce a new drama series in 2013, Devil’s Playground. Featuring Simon Burke in the role he played 37 years ago, this provocative new series is a follow up to the 1976 Fred Schepisi film The Devil’s Playground. Set in 1988, the new series will see Tom Allen (Burke) as a psychiatrist given the task of counselling priests. The Church is at a crossroads and the greatest scandal ever to threaten Catholicism is about to break. primetime screening at 9.45pm EST).  Acclaimed and popular chef Matt Moran will host a brand new series for The LifeStyle Channel in 2013. From Paddock to Plate, produced by ITV Studios Australia, will premiere in the second half of the year and take Matt back to his roots in the country as he searches for the best produce available and meets some friends to create some amazing recipes and dishes.  Also joining The LifeStyle Channel’s local line-up is River Cottage Australia, the first international version of the hugely successful River Cottage series, coproduced by Granada Media Australia and Keo Films. Mentored by Hugh Fearnley-Whittingstall, River Cottage Australia will introduce the new ‘Aussie Hugh’ and test his knowledge of food, enthusiasm for all things wild and local, and his resilience in setting up a sustainable farm in the Australian countryside.  LifeStyle FOOD has two local productions coming soon. Ask The Butcher explores cooking at home and how best to utilise the meats readily available at your local butcher (Tuesday, March 26 at 8.30pm). Marion’s Thailand sees former MasterChef contestant Marion Grasby travel to Thailand to explore the amazing flavours and culinary culture (premieres June).  Hit channel A&E will premiere Aussie Pickers in May. Based on the incredibly popular international format, Aussie Pickers Lucas Callaghan and Adam McDonald will hit the back roads of Australia, earning a living by restoring forgotten relics to their former glory, transforming one person’s trash into another’s treasure. The eight part series is being produced by Shine Australia.  Also new to the factual programming slate is Coast Australia which will launch on The History Channel in the second half of 2013. Acclaimed historian and television presenter Neil Oliver will host this eight-part series focusing on Australia’s stunning coastline. Each one hour episode will target a different strip of coast, as Neil and his co-hosts gather stories about the history, people, archaeology, geography and marine life. The series will cast its line back tens of thousands of years, as well as study very contemporary modern social history. It will join the past and the present together – and build a true story of a country which lives in synergy with its vast coastline, by meeting and talking with people from all walks of life.  Outback Coroner will premiere on Crime and Investigation Network in late 2013. Produced by Screentime in association with Evershine, this engaging and deeply emotional observational documentary series follows various coroners from all over Australia as they navigate time, distance, suspicion and culture, in search of answers to mysterious and unexplained deaths in outback and rural areas of Australia. The eight episode series will take viewers inside the mindset and challenges confronting a coroner and their team, as they investigate the forensic evidence, conduct autopsies and counsel the bereaved in search of answers.  FOX8 juggernaut Australia’s Next Top Model will premiere on FOX8 in July and the eighth season will be hosted by uber-model and businesswoman Jennifer Hawkins. Production is underway in Sydney and the new series will feature a new judge, model and DJ Didier Cohen, as well as leading fashion designer Alex Perry and Charlotte Dawson. Australia’s Next Top Model is produced by Shine Australia.  Foxtel Go, the app that allows customers to watch Foxtel on the go is now available on compatible iPhone and iPod Touch, as well as iPad and iPad mini. FOX Sports 1, 2 and 3 are all now available on the revolutionary app for Foxtel customers. In March Foxtel Go will be ready to offer more than 50 live channels via the app. – studio deals with Disney / Disney Jr., MGM and ABC Family. – HBO content Exclusive to Showcase, with titles not reaching Free to Air for at least 5 years. – EPG to be revamped with a “sexier” feel, and offering Reverse function that enables select titles to be viewed from the preceding 26 hours. -MyStar to include internet capacity. Foxtel is still in discussions on Rove LA and Project Runway Australia while The Real Housewives of Australia is expected in 2014. Great news that foxtel go is adding more live channels. I hope the “sexier” EPG means the channel order is cleaned up. Hide all the HD channels if u dont have an HD box, move bbc world news under news channels, all the FTA channels should be listed in the FTA category. I already asked about assembling the FTAs together. It remains the biggest gripe according to Audience Inventory surveys. Foxtel told me it isn’t happening. Why? It reinforces the variety of Freeview, their opposition. So the newsroom goes from soho to showcase. Might have to seek these eps elsewhere. So The Newsroom moving to the movie package even though SoHo’s Facebook page have been saying that season two will be on Soho. Is that all Soho is going to be? A promo channel for Showcase where they will show a series and if people enjoy it, they will move it to Showcase. Very unhappy!!! One of SoHo’s main attraction’s now gone. so I got season 1 on the newsroom on soho for as part of my package now I need to get the lame movie package to see season 2? and as for this express bs, they started that last year with Grimm, Revolution, the Walking dead. etc they have been on replay for the last 2-3 months because the US is on a break. during the summer months there is pretty much nothing on fta tv and because of this express crap there was pretty nothing on foxtel. 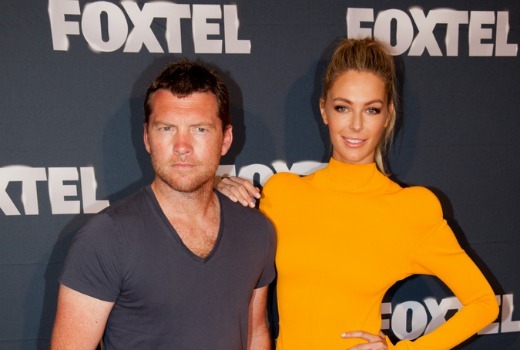 Is that a cardboard cutout of Jennifer Hawkins, and why does she have softballs on her shoulders? Very happy to see my favourite shows fast-tracked, and most on Showcase (no ads or watermarks)! However very sad to see all the excellent HBO programs won’t be available to FTA for 5 years – too many people condemned to miss the best TV has to offer. the government should be forcing foxtel to open up its monopolistic practise and demand fox sports 1/2/3 be available on other platforms. if they ever did, Foxtel would be history…..
would love to watch fox 1/2/3 via iptv…..
Disney, I know have come to arrangement with foxtel for movies, The Avengers and The Muppets will be on Premier in March. I guess MGM has also come to agreement with foxtel for movies(The Terminator (1984 Film),Silence of the Lambs, Rocky films, Bond films) will appear on the foxtel movie channels at some point now. Chicago Fire isn’t been fasttracked, its weeks behind. Does that mean if it gets picked up for a second season then it will air here hours later? Seems odd that its on their list when Hart of Dixie is just a week behind the US & isn’t there so its closer to being express (& actually says its express) than Chicago Fire is. So for the huge amount of money that Foxtel makes from ripping everyone off they are only producing 2 local scripted programmes? The Govt should really start clamping down on them. So Newsroom is moving from SoHo to Showcase? A good move seems though it should have been there in the first place but bad marketing for SoHo given it launched SoHo and got it huge ratings. I’m glad Showcase picked up Movie Extras’ Mad Men rights – but it’ll be in HD as well as fast tracked for the first time. David can you expand on those deals with Disney/Disney Jr., MGM and ABC Family? Are Disney and MGM the movie rights for Foxtel Movies and ABC Family for FOX8?